a PhD, Research Fellow, Istituto Ricerche, Area Science Park, Padriciano 99, 34149 Trieste (Italy), claudio.cozza@areasciencepark.it. b Full Professor, DESP, University of Urbino, via Saffi 42, Urbino (Italy), antonello.zanfei@uniurb.it. Using empirical evidence from the Italian R&D survey, we assess the ability of multinational firms in setting-up technological linkages (Extra-muros R&D and R&D cooperation). We have found that Italian multinationals are more prone to perform Extra-muros R&D, while foreign multinationals are better at developing R&D cooperation. However, when selecting only the linkages with local counter-parts, we find that foreign multinationals have no advantage vis-à-vis Italian firms; while multinationals still have some advantages in setting-up R&D cooperation with local universities. Results suggest that foreign multinationals can generally exploit “economies of common governance” when setting-up technical linkages, but they face relative disadvantages in terms of embeddedness in local systems. Key words: Multinational firms; R&D; technological linkages; universities. Este artículo, con datos sobre I+D en Italia, mide la capacidad de las empresas multinacionales de crear enlaces tecnológicos (I+D Extra-muros y Cooperación en I+D). Se encuentra que las multinacionales italianas son más propensas en hacer I+D Extra-muros, mientras las multinacionales extranjeras desarrollan más la Cooperación en I+D. De todas formas, seleccionando solo a los aliados locales, se obtiene que las multinacionales extranjeras no tienen ventajas en comparación con las empresas italianas, salvo que en el caso de la Cooperación en I+D con universidades. Estos resultados implican que las empresas multinacionales pueden explotar economías de bienes comunes, pero tienen dificultades para integrarse a los sistemas locales. Palabras-clave: empresas multinacionales; I+D; enlaces tecnológicos; universidades. À partir de données sur R&D (en anglais I+D) en Italie, on mesure la capacité des entreprises multinationales de créer des liens technologiques (R&D extra-muros et Coopération en R&D). On observe que les multinationales italiennes sont plus enclines à faire R&D extra-muros, alors que les multinationales étrangères développent davantage la Coopération en R&D. De toute façon, si on sélectionne uniquement les partenaires locaux, on observe que les multinationales étrangères n’ont pas d’avantages par rapport aux entreprises italiennes, sauf dans le cas de la Coopération en R&D avec des universités. Ces résultats impliquent que les entreprises multinationales peuvent exploiter des economies of common governance, mais ont des désavantages d’embeddedness (intégration) dans les systèmes locaux. Key words: entreprises multinationales; R&D (I+D); liens technologiques; universités. Este artigo, com dados sobre I + D na Itália, mede a capacidade das empresas multinacionais de criar vínculos tecnológicos (I + D Extramuros e Cooperação em I + D).Verifica-se que as multinacionais italianas são mais propensas a fazer I + D Extramuros, enquanto as multinacionais estrangeiras desenvolvem mais cooperação em I + D. Em qualquer caso, selecionando apenas os parceiros locais, você entende que as multinacionais estrangeiras não têm vantagens em comparação às empresas italianas, exceto no caso de cooperação em I + D com universidades. Esses resultados implicam que as empresas multinacionais podem explorar economias de governança comum, mas têm desvantagens de imersão nos sistemas locais. Palavras-Chave: empresas multinacionais; I+D; enlaces tecnológicos; universidades. It is widely recognised that linkages between foreign multinational firms (MNFs) and host economies constitute fruitful channels for the generation of positive externalities, both economic and technological. In fact, through the creation of intra-and inter-sectorial linkages, MNFs can generate new market opportunities in the context where they are operating, or crucial knowledge exchanges with local firms (see Castellani, Mancusi, Santangelo & Zanfei, 2015; and Crescenzi, Gagliardi & Iammarino, 2015, for a recent literature review on this topic). In particular, the international spread of MNFs internal and external networks allows them to tap into a wider knowledge basin (Castellani & Zanfei, 2006; Zanfei, 2000). On the one hand, individual subsidiaries of an MNF group have access to knowledge assets of other firms of the group, thanks to its internal network; whereas, on the other hand, they also have access to the knowledge bases of the contexts where they operate, using the external networks of inter-firm cooperation and technical alliances. From a theoretical point of view, this capability of managing both large internal and external networks of knowledge have been named by Dunning (1993), “economies of common governance”. These economies are part of the Ownership Advantage of MNFs: for Dunning, they concern the organisation of MNF Ownership advantages with complementary assets. Recently, this concept has been recalled by Narula (2014, p. 6): economies of common governance “are capabilities for the creation and coordination of efficient internal hierarchies and markets within MNEs that span a complex diversity of locations”. Among the linkages - both contractual and collaborative - that MNFs develop where they locate their own activities, a fundamental role is played by those created with universities and technological centres (Broström, McKelvey & Sandström, 2009; Santangelo, 2005). As centres of knowledge accumulation, universities can be “privileged counterparts” for MNFs in the development of technological absorption and transfer. Furthermore, universities can also act as key nodes for the transmission of such accumulated knowledge to local firms and institutions. When considering the case of a large industrialised country like Italy - one might wonder to what extent foreign MNFs are able to develop technological linkages with local firms and universities. In particular, the Italian case is notably affected by a limitation in attracting FDI, especially in R&D (see, among others, Dachs, Stehrer & Zahradnik, 2014). Therefore, it is reasonable to ask if foreign MNFs should really be considered as sources of knowledge and technological spillovers for the Italian innovation system; or, in other words, if this system can really benefit from these spillovers in order to speed-up in its process towards structural changes and competitive development. To answer to such questions, recent studies have used the Italian business R&D survey (Bonaccorsi & Perani, 2014; Cozza, Perani & Zanfei, 2016; Cozza & Zanfei, 2014, 2015) that is described in section 2. This section also provides an overview of R&D conducted by domestic and foreign firms in Italy; section 3 presents empirical results of the degree of technological linkages by MNFs in Italy; section 4 focuses on the linkages created with Italian universities; and section 5 pro-vides conclusions. Before assessing the degree of linkage creation by MNFs in Italy, it is worth giving an overview of their role in the R&D undertaken in Italy. The data comes from the Italian business R&D survey (RS1) that collects information on R&D activities performed by residential firms in Italy (both domestic firms and subsidiaries of foreign MNFs). It has been the main source of information on this subject since its establishment in 1963, and follows the methodological guidelines contained in the OECD’s Frascati Manual (2002). Currently, it is an annual survey conducted by the Italian National Bureau of Statistics (ISTAT) and follows a census approach, thus targeting all potential resident R&D performers in the country. Variables in this survey cover many aspects of R&D activities, providing a comprehensive and detailed description of the innovative behaviour of firms. The main variables used for analysis include: total R&D expenditures, broken down by type of expenditure, type of research, and source of funding; total number of R&D employees, broken down by age, gender, role and education level; geographical distribution of R&D across Italian regions; scientific and technological fields of research; and foreign ownership, if any. The ISTAT RS1 survey also provides measures of technical linkage creation, such as the amount of Extra-muros R&D expenditure and the (dichotomy) variable on R&D cooperation. These two variables have been alternatively used as dependent variables in the regressions presented in this paper. In the case of R&D contracting out and of R&D cooperation, the survey also permits distinguishing between different types of counterparts, including business firms and universities. Finally, each firm in the RS1 dataset can also be distinguished according to several other characteristics: its size, expressed in terms of total employees; its capital expenditure; its principal (3 digit) sector of activity; its belonging to a group (domes-tic or foreign owned) rather than being an independent company. This last variable made it possible to develop the categories used in the studies cited in this paper. The RS1 survey over the 2001-2010 period includes all firms active in Italy which responded to the R&D survey at least once during the given period, for a total of 39,152 observations corresponding to 13,675 firms (see Bonaccorsi & Perani, 2014, for further details on the panel). Empirical analyses shown in this paper have instead been run on a sub-set of firms included in the RS1 survey, comprising all firms with at least one year of positive R&D during the 2001-2010 period; the number of firms in this sub-set ranges from 2,582 in 2001 to 5,908 in 2010. Foreign MNFs are among the top R&D investors in Italy. ISTAT R&D data shows that, over the 2001-2010 period, the average R&D expenditure per employee was around 33,000 euros in the case of foreign MNF subsidiaries, while it was around 25,500 euros for Italian groups, and lower than 19,000 euros for Italian firms not belonging to any group. Albeit relevant, the share of foreign MNFs research in Italy decreased remarkably over the last decade, both in absolute values and relative to overall Italian R&D (see figure 1). The reduction in involvement of foreign MNFs in innovative activities was also confirmed by the strong decrease in their R&D expenditure per employee: although with some oscillations, from absolute values higher than 30,000 euros at the beginning of the period, their efforts decreased to less than 20,000 euros in the last years in the time period (the lowest value, 15,000 euros, was reported in 2008; while it was 17,000 euros in 2010). Such a narrowing role of foreign firms in Italian research reflects, on the one hand, the low attractiveness of Italy concerning high value-added investments; and on the other hand, it is complementary to a growing R&D expenditure of domestic firms (see again figure 1). It has to be underlined that, over the last years in the time period, the sharpest growth was represented by Italian firms not belonging to groups (see table 1). These firms, although individually characterised by low volumes of R&D, are more numerous and have recently increased their R&D efforts. As known, it is the case of Italian SMEs. Such an increased effort of Italian firms in R&D is per se a positive signal; however, it is worrying to see the diminishing role of foreign MNFs, given that the latter can be expected to have higher capacity to exploit economies of scale in research and to be better connected with transnational knowledge networks. Finally, the R&D activities of Italian MNFs abroad are also increasing, although they are still quite limited in absolute values (more details on this topic can be found in Cozza & Zanfei, 2014). Table 1 Description of Main RS1 Variables, by Typology of Firm. Source: Cozza and Zanfei (2015), ISTAT-RS1 data. Source: Adapted from Cozza and Zanfei (2014), ISTAT-RS1 data. Figure 1 Trends of R&D Expenditures in Italy, by Type of Firm, Years 2001-2010. Therefore, in order to evaluate the propensity of MNFs to set-up technological linkages, such a critical scenario has to be taken into consideration. In fact, the Italian case seems to be characterised by a gradual “technological hollowing-out”, mainly due to the sharp decrease of foreign investors’ R&D. From this perspective, the increasing R&D efforts of smaller firms can hardly compensate for the loss of foreign R&D and, what’s more, the growing outward R&D of Italian MNFs might be worrying. Although such trends are not negative per se, they might signal a lower ability of the Italian system to perform “large scale research”. The reduction in the role of larger Italian firms and the disinvestment of foreign MNFs are signals that point in this direction. Given this picture, foreign firms in Italy seem less capable of transferring cross-border knowledge, which might suggest that it is not possible to rely on their contribution in terms of linkage creation and technology transfer with Italian firms and universities. Taking into consideration the role of foreign firms in the setting-up of local linkages with firms and institution, an established literature highlights positive mechanisms. The hypothesis that MNFs are particularly prone to developing both cooperative and contractual relations in the field of R&D relies on the concept of “economies of common governance”. As mentioned in the previous section, Dunning (1993) uses this concept to refer to the capacity of firms to absorb and transfer knowledge as well as to coordinate external linkages. Such a mechanism is usually associated to growth in size, diversification, and the development of complex organisational routines within firms. As a consequence, MNFs can be expected to exploit such advantages more than other types of firms: given their nature, they are used to managing geographically dispersed activities, organising heterogeneous competences, and acting in very different institutional contexts. To summarise, the higher capability of MNFs to develop linkages with firms and institutions probably reflects a wider and deeper experience in international markets and productive contexts, especially if accumulated over the years (Castellani & Zanfei, 2006; Narula, 2014; Zanfei, 2000). In order to explore the extent to which MNFs operating in Italy have specific capabilities of linkage creation, we use two variables from the Italian RS1 survey: the amount of R&D contracted out to partners (so called Extra-muros R&D); and the setting-up of R&D collaborations. A recent study (Cozza, Perani & Zanfei, 2016) has shown that MNFs active in Italy are indeed more involved in these two types of technological linkages, compared to other types of firms. In table 2 we report the econometric results of this study, where dependent variables are alternatively “Extra-muros R&D” (results of an OLS regression are reported in the first and third columns) and a “dummy” indicating whether the firm has an on-going “R&D Cooperation activity” (results of a Logit regression are reported in the second and fourth columns). These empirical results highlight that multinationality plays a positive role in the propensity to adopt both linkage strategies (Extra-muros R&D and R&D Cooperation). Furthermore, the results distinguish between Italian MNFs (first row in table 2) and foreign MNFs (second row), comparing them to non-multinational firms responding to the RS1 survey during the 2001-2010 period (and which represent the “baseline” of the empirical model). Several control variables, apart from the usual ones such as firm size, age and sector of economic activity, are included in the estimations: R&D intensity and R&D quality (total R&D expenditures and percentage of employees that are researchers, third and fourth row in the table respectively); number of Italian regions where R&D is executed (fifth row); and degree of firm internationalisation (percentage of foreign countries and foreign subsidiaries in total, sixth and seventh row respectively). Robust (for heteroscedasticity) standard errors in parentheses. *** p < 0.01, ** p < 0.05, * p < 0.1. Source: Adapted from Cozza, Perani and Zanfei (2016). As compared to non-multinational Italian firms, all MNFs (both Italian and foreign) are more prone to contract out R&D and to cooperate in R&D (first two rows). The coefficients reported are positive and significant for all MNFs and represent their differential in terms of linkage creation. Such a result confirms that MNFs are, on average, more capable of developing technological linkages, as a result of their higher “economies of common governance”. 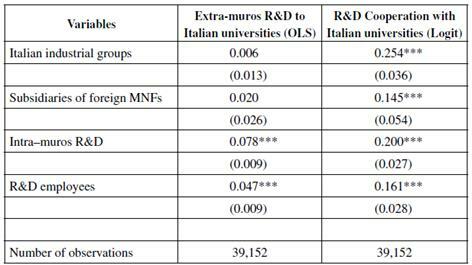 However, when distinguishing between the two types of linkages, it turns out that Italian MNFs are more prone to use Extra-muros R&D, while foreign MNFs are more likely to use R&D cooperation. The difference might signal that foreign MNFs are better able to develop complex interactions with external partners - such as cooperation - thus implying more intense knowledge exchanges than in the case of contracted-out R&D. This is also consistent with the fact that the internationalisation of Italian firms is a relatively more recent and unstable phenomenon, at least with regards to foreign competitors, especially MNFs coming from countries like the US, the UK or France which is where the majority of foreign firms operating in Italy come from. In relative terms, Italian MNFs have therefore set-up a smaller network of foreign subsidiaries as well as weaker international linkages, thus accumulating less “economies of common governance” and less capability of cross-border knowledge exchanges. These results concern the propensity of MNFs to develop technological linkages in general, that is, without taking into consideration neither the typology of the partner, nor its geographical location. In other words, without distinguishing between, on the one hand, private firms vs. public research organisations and universities; or, on the other hand, Italian and international partners. From the latter distinction, it is arguable that linkages with local counterparts are expected to generate more technological spillovers as well as opportunities for the development of the host economy. From such a perspective, it is obvious that MNFs have an advantage in terms of “economies of common governance”; however, they also have a disadvantage in terms of acquaintance with the local system. This disadvantage reflects a lower embeddedness in the host context, as well as difficulty in interacting with local institutions, especially in certain countries (as is the case in Italy). The disadvantages mentioned are indeed captured in the third and fourth columns of table 2, where the different propensities of MNFs to engage in local linkages are shown. Foreign MNFs, although more capable of developing linkages in general and internationally, are less prone to establish both types of technological linkages in Italy. They are by far less capable of exploiting the advantages that Italian MNFs have given that they are more embedded in the local context. In 2010 (the last year in our time series), only a limited number of R&D per-formers in Italy (about 15% of 5,908 respondents) had technological cooperation with Italian universities. Grouped by type of R&D performer, R&D cooperation with universities was carried out by 19% of firms belonging to an Italian group, 16% foreign MNF subsidiaries, and 13% of Italian firms not belonging to any group (independent firms). These independent firms have been increasing their cooperation with universities. Their growth rate over the 2001-2010 period was about 11%, while this rate was only 6% for Italian firms in a group, and it was even slightly negative for foreign MNFs. This last result confirms the disinvestment trend of foreign MNFs in the Italian R&D system. Consistent with the empirical evidence shown in table 2 in regard to linkages with all local partners, foreign MNFs have no advantage in cooperating with local universities, as compared to their Italian counterparts. The first column of table 3 indicates that both Italian firms in a group and foreign MNFs have no additional propensity to contract out R&D to universities, when compared to the rest of Italian independent firms (which are the baseline of the econometric model). The second column illustrates that both firm typologies have an advantage in having R&D cooperation with Italian universities (coefficients are positive and significant in both cases); how-ever, such an advantage is clearly higher for domestic groups than for foreign MNFs. Table 3 Main Explanatory Factors of Technological Linkages of R&D Performers in Italy with Italian Universities. Robust (for heteroscedasticity) standard errors in parentheses. *** p < 0.01, ** p < 0.05, * p < 0.1. Source: Adapted from Cozza and Zanfei (2015). In this paper, we have presented empirical evidence regarding the propensity of MNFs to set-up technological linkages with counterparts in Italy. The results suggest that the involvement and the positive effects of foreign firms in Italy might be decreasing, and that might be a problem for the Italian research system. In fact, on the one hand, foreign presence in Italy is scant and increasingly weak in terms of R&D, implying the exit of Italian actors from the global knowledge production network. On the other hand, MNFs - although generally better at setting-up international linkages in R&D - appear to be less prone to doing so with their Italian counterparts, including universities. In comparison, Italian MNFs are stronger when it comes to linking themselves to local partners, both firms and universities, probably because of their higher ability to be rooted in the system and the consequent lower transaction costs. These results also have implications for the promotion of the internationalisation of Italian R&D. The analysis confirms that the attraction of FDIs is not per se a guarantee of technological linkages with local partners that might lead to economic development. At the same time, the mere promotion of the internationalisation of Italian firms might not be enough: although local firms appear to be better at linkage creation, they might be less connected to global research and innovation networks. As a consequence, a double strategy is needed: on the one hand, attracting and favouring the embeddedness of foreign firms in the Italian R&D system; while on the other hand, supporting the growth of Italian R&D performers and their connection to international research networks. The combination of the two strategies seems to be the only way to invert the declining trend of the Italian R&D and economic system. *Sugerencia de citación: Cozza, C., & Zanfei, A. (2018). Multinational firms and the creation of technological linkages in Italy. Cuadernos de Economía, 37(74), 429-442.